Being so oddly pale (for someone from a very Mediterranean background, anyway), I often struggle to find foundations that suit my slightly warm skin tone without making me look too orange or giving me serious ‘tide marks’, so I’m always interested in ranges with a good selection of shades. 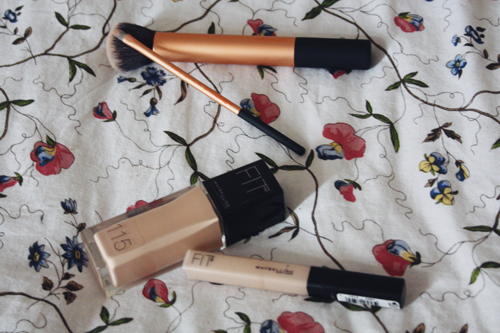 Naturally, when I spotted a display for Maybelline’s new ‘Fit Me’ launch in my local Boots, I couldn’t resist taking a peek, and soon found myself investing in both a foundation and concealer from the selection. I settled on shade 115 from the range, which, according to the ‘Fit Me’ website, is the palest option for pink-toned skin (although, personally, I think it looks more yellow-based, so I’d recommend heading into a store before investing), and fell in love from the second I applied it. 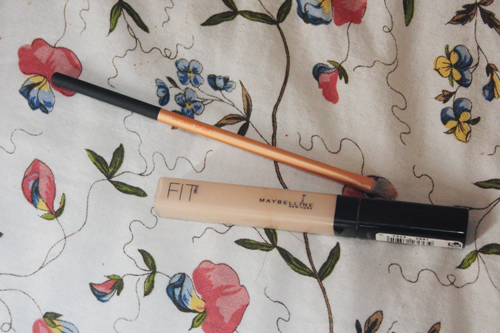 I’m a huge believer in keeping foundation light, and relying on concealer to do all the extra work, and there’s no doubt that Maybelline ‘Fit Me’ definitely has a very light-medium coverage, especially when applied with the Real Techniques buffing brush, creating a very natural base, for anyone lucky enough not to need concealer. A little product goes a long way, too, with two pumps of foundation being more than enough to cover my whole face and neck in a soft, light base, although it does need a liberal dusting of face powder, with a slightly-less-than-matte finish. 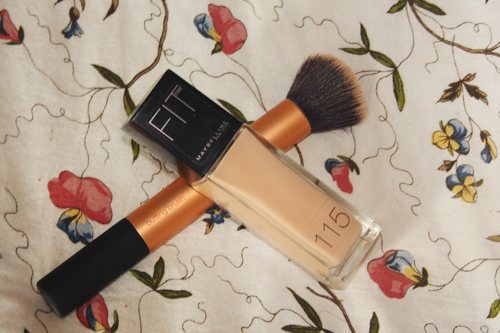 Each foundation in the range has a corresponding concealer (as well as a face powder and blusher, if you’re looking for a serious beauty overhaul), and shade 15 is mine. Although I, like most beauty bloggers I know, have been seriously infatuated with Collection’s ‘Lasting Perfection’ concealer for over a year, the seriously limited selection of shades has always been a problem for me (I’ve been mixing shades 1 & 2 together for what feels like a life time), and it’s never been a perfect match. Since discovering ‘Fit Me’, however, this problem no longer exists, and concealed patches look much less obvious. The coverage isn’t quite as heavy as ‘Lasting Perfection’, I have to admit, but it’s very buildable, and using Real Techniques’ detailing brush to apply the necessary amount of product creates a virtually flawless base, even on those pesky imperfections. 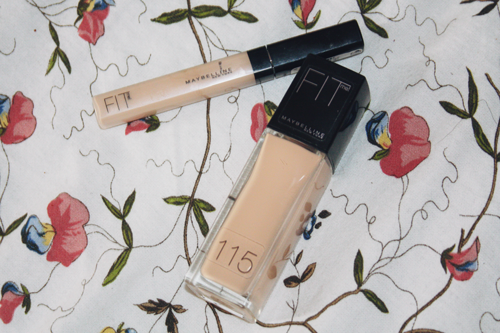 Overall, I am incredibly impressed with the Maybelline ‘Fit Me’ range; although my skin is far from perfect, this combination of foundation and concealer has got me having the most flawless complexion I’ve had in years, and without looking like a satsuma. Both products also have serious staying power, and last throughout the day with very little need for touch-ups, making them firm favourites in my make-up bag. I’d seriously recommend these products for anyone who has trouble finding shades to suit their skin tone (especially any other pale ladies! ); you can find your perfect ‘Fit Me’ shade on the Maybelline website. Maybelline Fit Me Foundation retails at £7.99 and can be purchased at Boots, or online; Maybelline Fit Me Concealer retails at £5.99 at Boots stores and online.